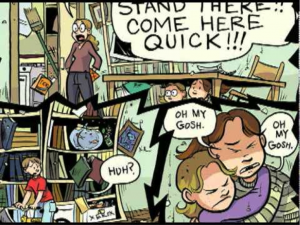 Welcome to Using Graphic Novels in Education, an ongoing feature from CBLDF that is designed to allay confusion around the content of banned books and to help parents and teachers raise readers. In this column, we examine books that have been targeted by censors and provide teaching and discussion suggestions for the use of such books in classrooms. This post takes a closer look at Smile by Raina Telgemeier. 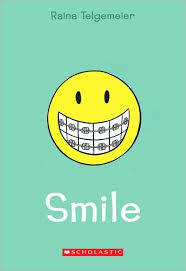 Smile is a New York Times bestseller; winner of the 2011 Eisner Award for Best Publication for Teens; winner of the Dorothy Canfield Fisher Award, 2012; winner of the Maine Student Book Award, 2012; finalist for the Children’s Choice Book Award, 2011; ALA Notable Children’s Book, 2011; Honor Book for the Boston Globe-Horn Book Awards, 2010; Kirkus Best Book of 2010; and the New York Times Editors’ Choice, 2010. In this autobiographical coming-of-age graphic novel memoir, Raina Telgemeier ruminates with humor and honesty on the tumultuous challenges and perils of her teen years: from the trauma of falling one night on her way home from a Girl Scout meeting severely injuring her front teeth, to dealing with boys, earthquakes and the true meaning of friendship. Smile is an empowering, heart-warming story about a typical teenager who feels out of place with her changing body, skin, and teeth, and whose only wish is to be a “normal” teen. What readers realize is that as Raina deals with accident traumas and earthquakes, navigates friendships with her childhood girl friends, and learns how to deal with boys in middle and high school, most of us have some kind of issue we must deal with in adolescence. As such, the book speaks honestly and humorously to us all. From beginning to end, Smile shows us how to gracefully embrace life’s twists and be more sensitive to others who are doing the same. Smile opens with Raina coming home from a Girl Scout meeting and racing with her friends to her front door. As fate would have it, Raina trips over her adolescent feet and realizes that while her bones seem whole and intact, her two front teeth are not. Her parents rush her to the dentist, who inserts the tooth she found and lowers the second tooth that was lodged up in her gums. However, after the tooth cast is removed, they find the gum and bone damage was so extensive that the two front teeth were fused too high in her mouth (looking like an inverted vampire). Raina undergoes a root canal and surgery to reinsert the teeth more securely. The operations fail, and her doctors decide to remove the teeth and with braces and move her other teeth to the front – a process that will take years, patience and considerable discomfort. Raina handles the news and pain with as much aplomb as a teenager might muster, along with some serious couch gaming (and painkillers) after surgery. While Raina’s tooth trauma frames the story, Smile is more about the traumas of teen hood. Through the years of braces and orthodontics, we follow Raina as she deals with a scary earthquake, crushes, parties with awkward spin-the–bottle games (which she decides not to join because she wants her first kiss to mean something), fickle friends who tease her (about her looks, her hair, her teeth, and her crushes); and teachers who, while trying to be supportive, instead focus more than necessary on the oral ordeals she’s dealing with. Raina eventually realizes that lots of other kids have braces and that friendship means supporting each other, not making things harder, and if your friends can’t do that, then they’re not really your friends. In short, this is an honest story about dealing gallantly with trauma while learning how to feel comfortable within one’s skin and to embrace one’s strengths, weaknesses, and quirks. Finally, it is a book about growing up and realizing that sometimes we need to rethink friendships. Teens in particular are so concerned about being liked and being part of a group that they often give up their individuality and respect. This is a book all about self-concept and respecting oneself. Discuss and chart the different themes Telgemeier presents in this work. 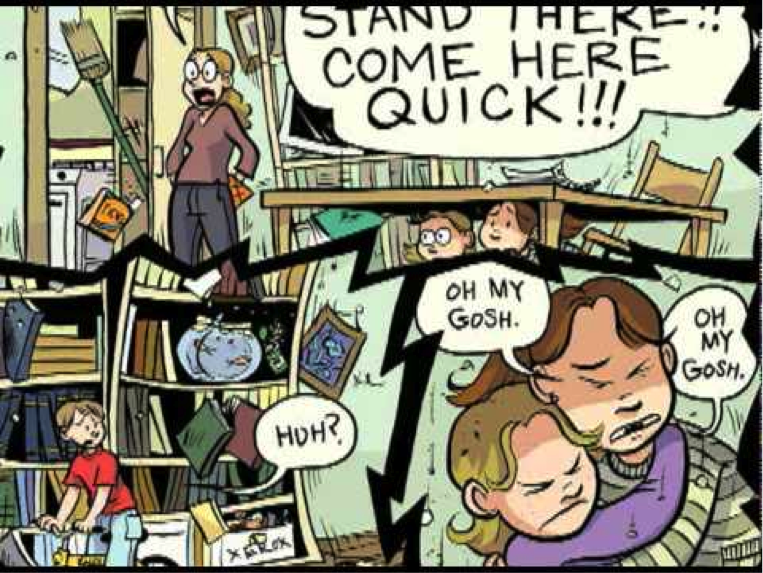 Compare and contrast how Telgemeier relates these themes in her graphic novel to the way other writers, such as Judy Blume, have done so in traditional prose texts. Discuss what it is like to feel and to look different from others and the importance of fitting in. Brainstorm and evaluate the different ways in which teens can feel and look different. Discuss different types of friendships one might have with others. Detail what it means to be a good friend. Discuss the challenges we have in determining and maintaining friendships, and why this is so important. Chart how Raina grows and matures over the course of the book. Discuss how Raina and her family and community deal with the earthquake, and compare this with natural disasters students have faced in your part of the country. Have students and their parents come up with family plans to help them prepare for and deal with life’s emergencies and natural disasters. Research and discuss root canals. Define and discuss different types of dentists and their specialties. On page 49, Raina says to her mother, “I’m starting to feel like a real teenager!” Discuss, draw, enact, and relate what being a real teenager means to your students. On page 56, Raina’s mother tries to make Raina feel better and notes, “Lots of kids wear funny stuff to help fix their bodies… You probably just don’t realize it because no one talks about it.” And Raina responds passionately, “Well maybe someone should start talking about it!” Brainstorm and discuss various issues most teens deal with but no one really talks about. Discuss how teens might help raise awareness for those issues. On page 141, Raina ruminates, “What if it is true? What if Sean really would notice me if I dressed differently? Would I be willing to change for him?” Discuss and debate how far, if at all, one should change their looks, interests, personalities, and/or beliefs for someone else. On pages 206-207 Raina reflects, “My life didn’t’ magically turn perfect… Instead I threw my passion into things I enjoyed rather then feel sorry for myself. I realized that I had been letting the way I looked on the outside affect how I felt on the inside. But the more I focused on my interests, the more it brought out things I liked about myself. And that affected the way other people saw me!” Discuss this reflection with your students. Ask them to create a collage of words and / or images that relate the things they do and their interests that help them define themselves. Discuss why Raina was so upset after her first day of high school. You may want students to relay their feelings and impressions of their first day in their current school. 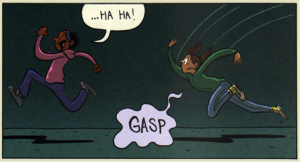 Discuss how Telgemeier combines text and images to express and explain Raina’s noting that “I imaging being perfect….won’t happen any time soon” on pages 162-163. Have students explain how Raina knows she won’t be “perfect” for a long time. Discuss what you think her definition of perfect is. What is your students’ definition of perfect? How do these definitions compare/differ? Discuss whether or not it is healthy to have a perfect goal or image. 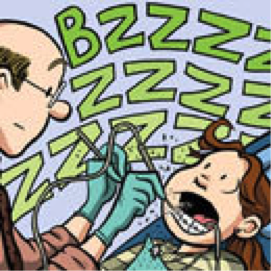 Discuss why Raina dreams during one oral surgery that she is losing a tooth. Discuss how Telgemeier uses images and text to foreshadow events. Have students go on a scavenger hunt for idioms, slang, colloquialisms, metaphors, and similes throughout Smile. Plot and compare the author’s use of vocabulary, slang, idioms, and images as she relates how her friends treated her. Chart and compare the derogatory words used by her initial friends versus the supportive words used by her later high school friends. Create a working definition of “hero.” Discuss and analyze whether Raina fits the definition. Have students share their own stories of feeling different and / or their stories of trying to fit in. Compare how the stories are told, and chart the words used to relate their challenges and their feelings. Compare and contrast Raina’s technique of distinguishing between her dreams (pp. 96-101) and real-life events. Page 11, right after tripping and getting a bleeding and shocked Raina into the house, there is a single-page panel of a very concerned mom looking in her address book and calling the dentist. Discuss why Telgemeier decides to emphasize this image to help readers fully understand and take in the seriousness of this accident. Compare the page full-page panel (right after the accident) on page 11 with other full-page-panels that signal time or scene changes (pages 64, 74, 81, 94, 104, 110, 120, 142, 151, 163, 169, 196, 205, 207, 214). Chart and discuss where full-page panels occur in the story, what is being conveyed , and how these panels pace the story. 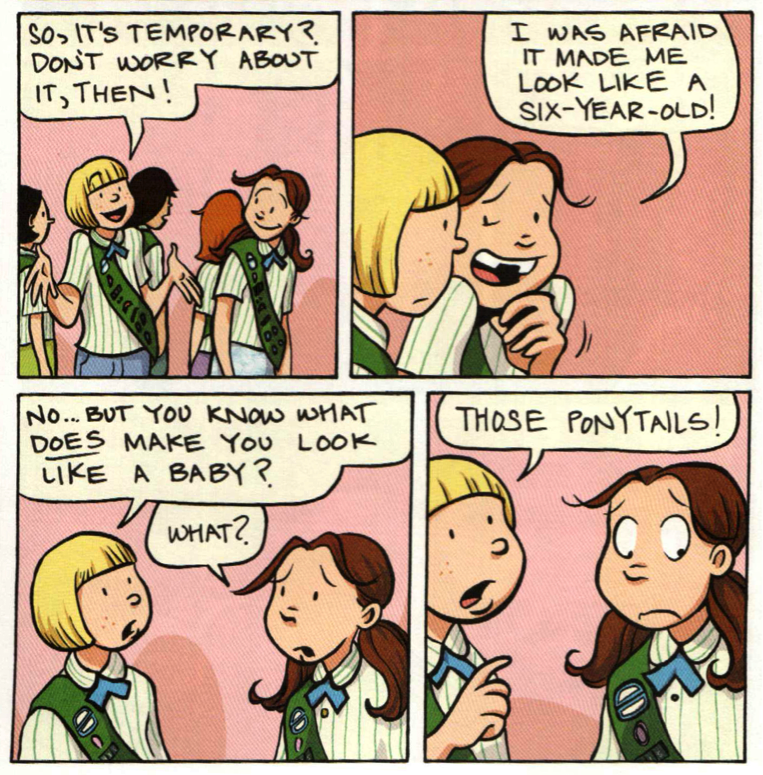 Discuss Telgemeier’s use of panel shapes to distinguish between events. For example, on page 66-67, Telgemeier uses jagged panel edges and gutters to emphasize the shifting tectonic plates of the earthquake and the fears and dangers of living through them. Chart Raina’s emotional ranges as shown throughout the book. Chart the different expressions and body language / postures and what each image relays. Discuss why being able to distinguish facial expressions is so important (learning, recognizing, and internalizing facial and social cues). You may even want students to do their own research with a camera, trying to capture’different expressions and postures of their family members or friends in action. Discuss, explain, and evaluate the message the author relates on page 205, on which her braces are removed. We see a close-up of her dresser — an image of an oval mirror with a ticket stub and early photo of Raina in her girl scout uniform, smiling with her original teeth, with a statuette of The Little Mermaid, a poster of Bart Simpson, her night brace placed around to candles right under the mirror. Why are these items included in the image, and what ideas are being conveyed? 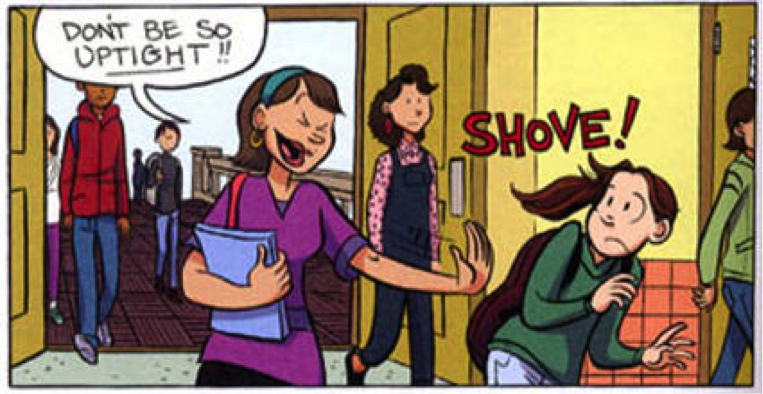 Drama by Raina Telgemeier — a fictional story about high school, friendships, and finding one’s voice. The Baby-sitters Club series by A.M. Martin, illustrated by Telgemeier –- a popular young adult series about teenagers that has been adapted into graphic novel format. Freckle Juice; Tales of a Fourth Grade Nothing; Are You There God? It’s Me, Margaret; and Otherwise Known as Sheila the Great –- just a few of the books Judy Blume wrote about the honest and humorous trials of growing up. Diary of a Wimpy Kid by Jeff Kinney — a series about a boy and his struggles in middle school. Maniac Magee by Jerry Spinelli –- about an orphaned boy looking for a home in a fictional Pennsylvania town. The Book of Three by Lloyd Alexander — about how a teen and farmhand who is hired to take care of a prophetic pig must deal with life challenges of, well, taking care of a prophetic pig. The Diary of Anne Frank by Anne Frank — relating what it was like as a Jewish girl hiding from the Nazis. Johnny Tremain by Esther Forbes — about life for a teen in Boston at the start of the American Revolution. Farewell to Manzanar by James and Jeanne Houston — about what life was like for Japanese-American teens and families as they were forced to live in internment camps during World War II. The Witch of Blackbird Pond by Elizabeth George Speare — a story about life for 16-year old Katherine Tyler, who must go live with her aunt and uncle in Puritan New England (Wethersfield, Connecticut) in the late 17th century. 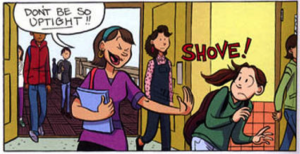 Be Confident in Who You Are by Annie Fox — a graphic novel that offers advice on common middle school concerns and practical advice for being healthy and for staying in control of your feelings and actions. Key ideas and details: Reading closely to determine what the texts says explicitly and making logical inferences from it; citing specific textual evidence when writing or speaking to support conclusions drawn from the text; determining central ideas or themes and analyzing their development; summarizing the key supporting details and ideas; analyzing how and why individuals, events, or ideas develop and interact over the course of the text. Craft and structure: Interpreting words and phrases as they are used in a text, including determining technical, connotative, and figurative meanings and analyzing how specific word choices shape meaning or tone; analyzing the structure of texts, including how specific sentences, paragraphs and larger portions of the text relate to each other and the whole; Assessing how point of view or purpose shapes the content and style of a text. Integration of knowledge and ideas: Integrating and evaluating content presented in diverse media and formats, including visually and quantitatively, as well as in words; delineating and evaluating the argument and specific claims in a text, including the validity of the reasoning as well as the relevance and sufficiency of the evidence; analyzing how tow or more texts address similar themes or topics in order to build knowledge or to compare the approaches the author takes. http://wn.com/raina_telgemeier — a presentation Telgemeier made at the 2012 National Book Festival about her books and work that demonstrates how she works as she tells her stories, with examples of real-life incidents from an audience of students. http://www.thecoolspot.gov/ — This website has facts about alcohol, peer pressure, “too much, too soon, too risky,” mood swings, and health, body, and mind. It is beautifully designed, fun to look through, and has fun quizzes to engage diverse readers. http://kidshealth.org/kid/grow/body_stuff/braces.html — a website with a number of health issues for kids, including getting braces, how braces work, life with braces, puberty, and growing up and staying safe. http://www.dentalfind.com/go/general-dentistry/article/dentistry_types.html — describes dentistry in general, dental health, and lists and describes different types of dentists (i.e. orthodontics, pediatric dentists, endodontics, oral surgeons, and periodontics). http://www.healthypeople.gov/2020/topicsobjectives2020/overview.aspx?topicid=2 — a website on adolescent health issues, interventions, resources and national data. http://www.nimh.nih.gov/health/topics/child-and-adolescent-mental-health/index.shtml — a website on child and adolescent mental health issues that includes downloadable publications. http://kidshealth.org/kid/feeling/friend/peer_pressure.html — a website helping kids deal with peer pressure. http://earthquake.usgs.gov/learn/kids/ — Earthquake hazards webpage for kids with information on the latest quakes, puzzles and games, earthquake history, science fair project ideas, earthquake facts, earthquake pictures, ask a geologist, the science of earthquakes, and more.